Grills have continually been a staple in hip-hop culture. Using metals as fillings for teeth has historically gone beyond simply being a fashion statement. A little history—wearing gold fronts as an accessory became popularin the '80s and was later integrated into the style and culture of New York in the '90s. It was the dirty South’s takeover of the early 2000s (a smile on the rocks!) that streamlined grills into the mainstream aesthetic. 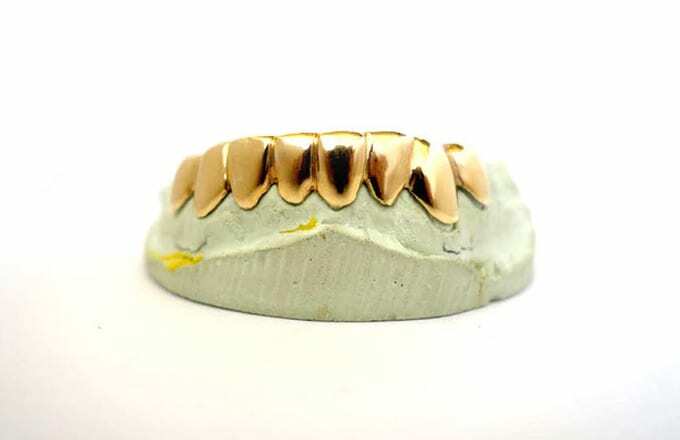 Now we’ve got grills for rappers (and people trying to look like rappers, too). Grills became such a prominent part of hip-hop culture because, along with chains and rings, they were a way to keep money without holding cash on you. This style of jewelry is an investment and a representation of who you are, what you do, and where you come from. Now the previously niche item has become commonplace and worn by celebrities in all shapes and sizes. Grills have undoubtedly become an art form. Some of the most iconic fronts and chains in the game are made by a god living in LA, Ian Marks, who calls himself The Gold Teeth God. From Kylie Jenner to Fredo Santana, The God can have your mouth’s net worth valued at Luxembourg’s pay per capita. I met up with the hoodrich George Foreman to learn exactly how these special dental amenities are made. Follow his Instagram @GoldTeethGod and get more info at www.goldteethgod.com.